The Form No. 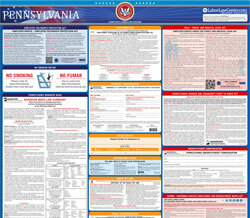 LIBC-500 (Rev 5-09) Workers' Compensation Insurance Posting is a workers compensation law poster by the Pennsylvania Department Of Labor & Industry. This is a mandatory posting for all employers in Pennsylvania, and businesses who fail to comply may be subject to fines or sanctions. This poster must be posted in a conspicuous place where all employees can see it. This poster is a form for applying for workers' compensation for if a worker is injured while working for an employer. It appears you don't have a PDF plugin for this browser. Please see the link below to download pennsylvania-libc-500-print.pdf. Any individual filing misleading or incomplete information knowingly and with the intent to defraud is in violation of Section 1102 of the Pennsylvania Workers’ Compensation Act, 	 	77 P.S. §1039.2, and may also be subject to criminal and civil penalties under 18 Pa. C.S.A. §4117 (relating to insurance fraud). The name, address and telephone number of your employer’s workers’ compensation insurance company, third-party administrator (TPA), or person handling workers’ compensation claims for your company, are shown below.